Shakespeare enjoys a peculiar place in the canon of English literature. Both a foundational document and endlessly mutable, it is performed, reenacted, remixed, and endlessly reinterpreted. Romeo and Juliet inspired the musical West Side Story. King Lear was translated into Akira Kurosawa’s opus film Ran. Recently, the tragedy of Hamlet was remixed into the Choose-Your-Own-Adventure style game-book, To Be or Not To Be. Toil and Trouble takes up from Macbeth, focusing not on the Thane, but the Witches. Structurally, it resembles the Tom Stoppard Play “Rosencrantz and Guildenstern Are Dead,” which follows the two titular henchmen from before their introduction and up to their bumbling, offstage demise. (Spoiler alert for a four-hundred and a fifty year old play, respectively.) 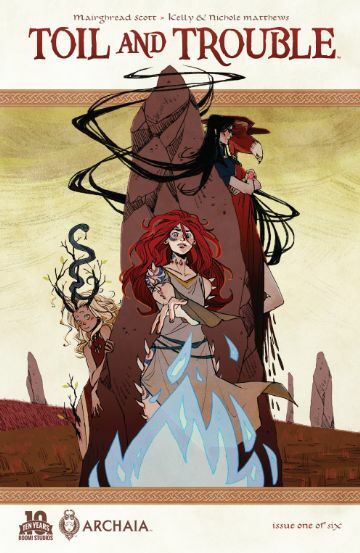 The comic follows Smertae, one of the three witches, returning to Scotland after being banished. The reason for her banishment is unclear, but seems to involve Macbeth. Like the Stoppard play, the action of the original Shakespeare drifts around and through the dialog of the comic. In this first issue, the reader sees an expanded version of the opening scene. In Scott’s version of events, the witches are agents of Fate, tasked with ensuring the continuity of Scottish royalty. To accomplish this, they mean to strike down Macbeth in order to give Prince Malcolm a trial to ready him for the throne. Smertae is against the plan, but reluctantly agrees. We then follow the witches in their work cursing Macbeth’s camp, and in the battle the next day, where Smertae makes a decision that goes against fate. I was drawn to this comic because I am a huge fan of the Scottish Play. The plot is an interesting take, and I’m excited to see how it interacts with the original. The writing is actually quite solid, and the dips into 17th Century language feel natural with the rest of the dialog. The world building is the biggest break from the original, but I’m a sucker for the concept of a fading magical world, struggling in the face of onrushing modernity, and Scott absolutely nails this fantasy milieu. What surprised me is the exceptional quality of the art. The Matthewses style is absolutely gorgeous, and the designs, particularly of the three witches, are immediately eye-grabbing and carry a lot of the story’s weight. The three represent Sea, Earth, and Sky. Smertae has crab-like spikes jutting from her body, and her sisters equally expressive of their elements. The ‘acting’ of the characters is also very well done. The meeting scene is wonderfully emotional without relying too heavily on the dialog to convey meaning, for example. The art is helped by bright and detailed coloring and inventive layouts, such as the climactic battle splash page, which features small circular insets showing the effects of the witches curses in the epic clash. “Toil and Trouble” is the first part of a series I can’t wait to read more of. Find it on Comixolgy, or in the rack at your local comics shop.